Today we drove an hour from the campground for a two hour tour of Hillside and Taliesin, which are celebrating their 100th anniversary this year. 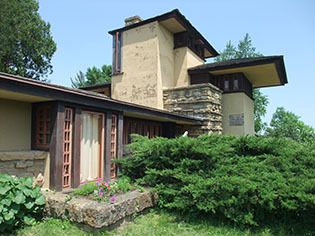 They were the summer home and architectural school of Frank Lloyd Wright during his lifetime, and the school is still in operation today. The students were preparing for an evening celebration of Wright's 144th birthday the day we were there. We were allowed to photograph only the exteriors, some of which are shown here. The first two are of Hillside and the last three are of Taliesin. Front Entrance of Hillside School of Architecture - the building includes a theatre and a 5,000 sq. ft. drafting studio. The tour guide was very knowledgable (as they always are at Wright buildings) and explained Wright's true genius - his students paid tuition and were the work crew who constructed the buildings, cooked, cleaned and ran the farm. Sweet deal for Wright, eh? Cornerstone of Hillside which reads 'F.L.L.WRIGHT ARCHITECT 1903'. The most interesting thing I learned was that these buildings were used as a continual experimental work in progress and they were only inhabited in the summer months. In winter the household and students stayed in Taliesin West in Scotsdale, Arizona. 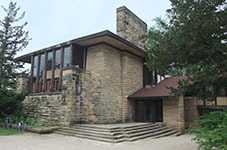 Wright lived and worked at Taliesin from 1911 until his death in 1959. Because the buildings were experimental, exterior terraces were often converted into interior rooms (sometimes in as little as two days, to fulfil a whim of Wright's to impress a visiting dignitary), so there were no proper foundation footings. This causes major problems for the preservation of the structures today. 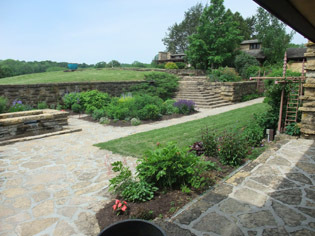 As in all Wright construction, these buildings use natural and local materials wherever possible, so stone and wood make up the majority of the structure. This makes the buildings blend harmoniously with the land. We were so pleased to be able to tour this remarkable testament to Wright's artistic vision. Karen and John say farewell to Taliesin. After our tour we drove back to downtown Deforest (a few blocks from our campground) to attend the Dragon Art Fair. Several streets were blocked off for the day for a display of arts and crafts booths and a field of classic cars. The local fire hall was celebrating its centennial so we bought hamburgers (we wanted cheeseburgers but the fireman said they ran out of cheese and John told him we could not believe Wisconsin the Dairy State was out of cheese!) and enjoyed the displays for an hour or so. The weather was really hot so we headed back to the campground for a swim in the pool. Our good friend Roger is an ardent admirer of the famous American architect Frank Lloyd Wright and Roger's enthusiasm has rubbed off on us. So when we travel we try to take in some of Wright's buildings that are open to the public. We stayed three days at an excellent KOA campground in Deforest, Wisconsin so we could tour two famous buildings that Wright designed; the first being the S. C. Johnson Administration Building, pictured below. S. C. Johnson Administration Building and Tower, Racine, WI. Since the 35 acre campus is still in use by the Johnson company, we were not allowed to take photos anywhere inside the gates, unfortunately. But we were privileged to take a free tour of the building on the left (built in 1936) and noticed all the curvy furniture that Wright designed is still in use by the employees today. It must be amazing to work in a national historic treasure! The natural light inside was beautifully softened by a roof of narrow clear glass tubes cemented together horizontally, supported by concrete pillars shaped like giant golf tees. The carpet and upholstery on the furniture was Wright's signature colour, Cherokee Red, which is sort of half way between dusty rose and brick red. 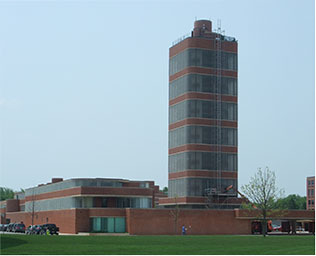 The tower, built in 1944, is no longer in use due to modern fire codes (stairways are too narrow and there is only one exit) but the president of the company insisted the building remain intact as a monument to Wright's genius. We felt so lucky to have visited there. Thanks for the tip Roger! 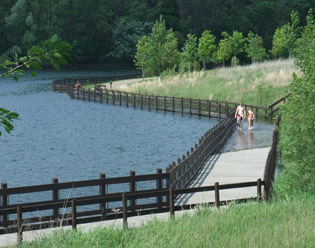 Flooded Boardwalk in Lansing, Michigan. We started our trip across the northern USA, from the Great Lakes to the West Coast, with a lovely weekend visit with our friends Murray and Marilyn in Elliot Lake. The weather was rainy so we cancelled plan A (going fishing in their pontoon boat) and enjoyed plan B (playing board games and eating well). In phoning ahead to book a campsite for the night, we heard that Michigan was pretty soggy with all the spring rains and flooding so we pressed on to Lansing and found a gorgeous private campground on a private lake and stayed there two days. The campground was just a block away from the start of the city biking trail (paved and wood boardwalk) so we managed a delightful but wearying 5 mile hike one hot afternoon through the city greenspace. Parts of the board walk were under water, so we could tell some flooding was happening in the area.